‘ATHENS UP’ is dealing with the regeneration one of the very central, important and ‘sensitive’ area in Athens, Omonoia Square. Omonoia square is an urban nodal point consisting one of the apex of the Athens’ urban “triangle” as it was designed by Architects/Urbanists Kleanthis and Schaubert, forming from three major road axes. Nowadays, Omonoia has become an uninviting place for Athenians to experience it, serving only the minimum to the city as a traffic and car intersection. Simultaneously, the City’s skyline lacks of hierarchy and differentiation in heights. At the same time, although Acropolis and the sea front are in close reach from the centre, every visual connection has been blocked from the dense Athens’ built environment. Therefore, ‘ATHENS UP’ proposes the creation of an observation tower of 150m, while this slender structure, will emerge from a green oasis with landscapes and bridge pathways, water features, becoming a new landmark for Athens, which will promote Athens iconicity and image to the world. The core of the proposal is the observatory tower which penetrates the city as an injection which triggers the square, re-vitalizing and re-activating the whole area, transferring the pedestrian flows from the horizontal plane to the vertical and vice versa, producing a new observation point while offering views towards the Acropolis, the sea and the Attica landscape. At the level of the public square, we create a network of pedestrian paths, continuing and emerging from the current surrounding roads and pathways while the Omonoia Square becomes a roundabout again, promoting the iconicity of the intervention. 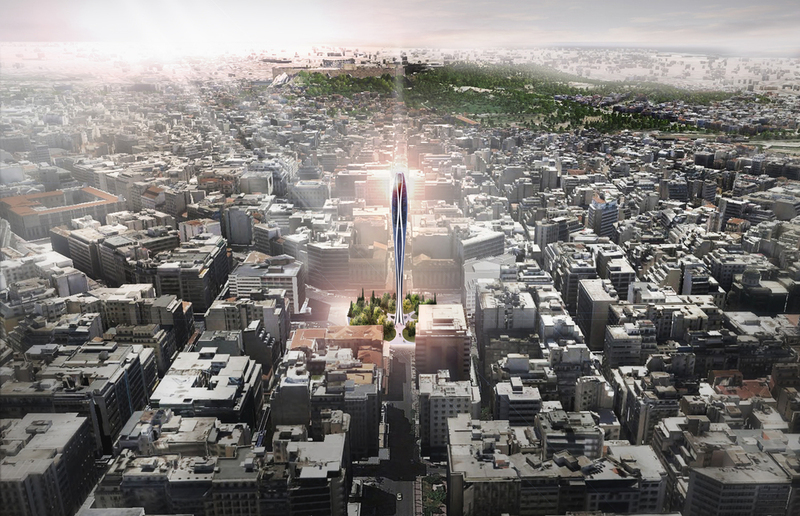 Thus, based on this urban periscope, the observation tower consists a new icon, a new landmark for the city, landed in one of the most nodal point of Athens, inviting the Athenians as well as the tourists to reinterpret Omonoia Square and the introduction of high-rise buildings and icons inside the city. Omonoia square has to be re-activated and become an attraction point for social interaction and observation of the city, for the Athenians and the tourists.